Did you hear about the so-called “monster train” that chugged through the Inland Valley on Jan. 10? This 3.5-mile Union Pacific test train, which traveled from Texas to Long Beach, was said to be the longest freight train in California history. At one point in its journey, the train spanned virtually the entire length of Pomona. Well, an Ontario man named Joe Perry, who’s a railroad buff, followed the train from Imperial County to Ontario, documenting various legs of the trip on his website, www.chasingsteel.com. Below is a video he shot from the Mountain Avenue overpass at about 2 p.m. The train, with nine locomotives and nearly 300 cars, takes almost five minutes to pass. You can read Perry’s account here. If you were in a hurry, you wouldn’t have wanted to be among the motorists stuck at a railroad crossing. You can see them streaming across the tracks the last few seconds of the video. 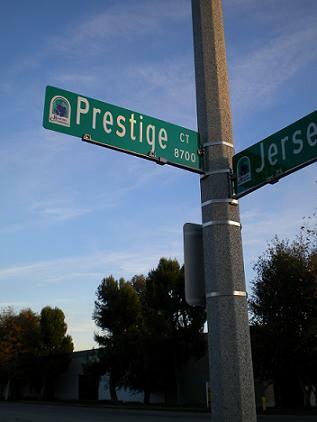 In Rancho Cucamonga, you can have instant prestige. All you need is an address on Prestige Court. Via LA Observed, we’ve learned of the deaths of Glen Bell and J. Putnam Henck. 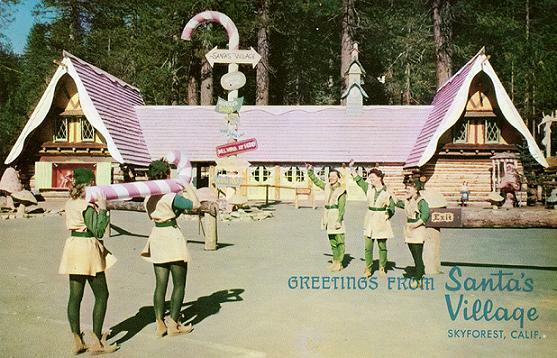 Bell, who got his start in San Bernardino, founded Taco Bell and Der Wienerschnitzel, while Henck created Santa’s Village, a former attraction near Big Bear that operated from 1955 to 1998. Update: Here’s Bell’s LA Times obit. The Images of Pomona blog asked to interview me. I complied — why not? — but spoke almost inaudibly (cars rushing by 50 feet away on Garey turned out to be louder than me, as you’ll notice). What can I say, I’m a soft-spoken person. I also couldn’t figure out what to do with my hands. Other than that, it was a huge success. At least for Whitney Hanlon, the interviewer. 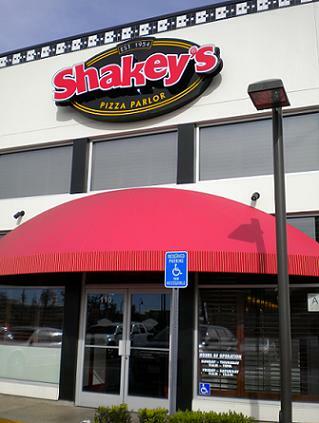 While it’s rare that I write about a chain restaurant, I have a soft spot from childhood for Shakey’s, and the new location at Victoria Gardens, which opened in December 2009, was mentioned in our paper recently for its “green” features. It has bamboo flooring, recycles its oil for biofuel and has 100 percent recycled napkins. Oh, and they serve pizza, too. The ragtime music, straw boaters and picnic seating are long gone, I’m afraid, but this Shakey’s still does a lunch buffet ($6.99) plus soda ($1.99) from 11 a.m. to 2 p.m. weekdays, with chicken, “Mojo” potatoes and plenty of pizza. At the peak of lunch they had 10 pizzas on the buffet. Shakey’s is my favorite corporate pizza. I like the crispy crust. The buffet also has salad, as well as a watery pasta that should be avoided. This Shakey’s has a bar with 12 beers on tap, including Sierra Nevada, Newcastle and Blue Moon. I sat at the bar because it’s the best seating for a solo buffet diner, read a Jack Smith book and sipped a Pepsi. The bar is said to be a twist on the “Ye Olde Public House” identity of the chain and an appeal to adults, not just families and youth sports teams. The restaurant also plays up its own kitsch to good effect with vintage advertisements and signs from the chain’s glory days. 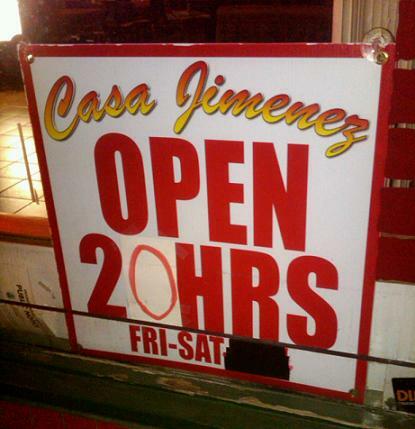 A downtown Pomona restaurant’s attempt to go 24/3 on weekends seems to have fallen short by four hours and one day. Well, it was a nice try. “UPLAND — Race on in to the Upland Public Library to hear Dave Allen, Vice President Marketing and Sales, Auto Club Speedway talk about the history of the Auto Club Speedway. Mr. Allen will also be sharing his personal racing experiences from his early childhood karting days at Laguna Seca to Crew Chief of a World of Outlaws Sprint Car Team. Don’t miss this opportunity to hear about a local racing venue and one of the most popular spectator sports in the world — Automobile Racing. I’m tempted to attend just to meet my doppelganger, Mr. Dave Allen. But if we shook hands, would the universe explode? Insert your own punchline below. I got knocked out by a cold. No “Restaurant of the Week” this week, but it’ll be back next week, as will I. This mural appears on the sandwich shop at 724 W. Holt Blvd., Ontario. I shot this months ago and forgot to share it here. 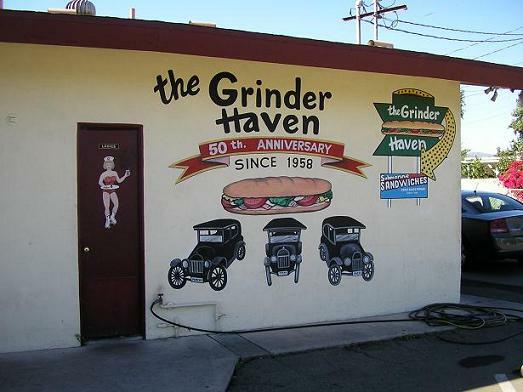 Very belated 50th anniversary, Grinder Haven!